Depending on the type of LED bulbs you pick, they can provide warm or cold light. Thus, they can mimic the natural daylight or provide a light more similar to the evening light. You can choose which type of light to use at which moment, so your employees can maximize their energy levels. Broad spectrum light supports the natural human circadian rhythm, allowing the workforce to stay active and productive during work-hours. Sustainable industrial lighting fixtures which resemble the natural daylight can also lower the stress level of your employees. This is called Attention Restoration Theory and is based on the fact that natural sunlight is a trigger for stress reduction. Combined with the high level of energy, lower stress can actually increase the productivity of your employees by up to 16%. Modern factories are far from the dark, dusty factories we used to know, but this doesn’t mean they can’t become even healthier environments. Switching to sustainable lighting can prevent certain medical conditions related to work, such as eyesight problems. If your employees have to work with small items under poor lighting, they might suffer from repetitive eye strain. Poor lighting can also worsen specific health conditions, like diabetes. 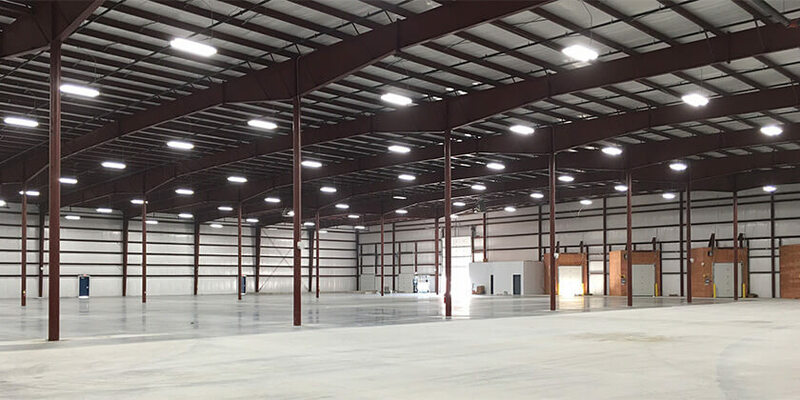 Some autoimmune diseases, hypertension, rickets and seasonal affective disorder can be prevented by embracing sustainable industrial lighting. Under poor light the risk of injuries increases dramatically, so LED industrial lighting fixtures can prevent workplace injuries in factories. If your employees have to work with machines or need to see fine details, the risk of accidents can be high under fluorescent or halogen light bulbs. By comparison, the broad spectrum light provided by LEDs improves the visibility, which can decrease the number of accidents. As a result, you will see a decrease in the number of compensations filled by your employees, which is another financial benefit of LED lights. All these benefits lead to a happy employee, which brings the manager a lot of benefits. A happy worker is productive and loyal, so they become a valuable resource of the company. Studies revealed that happy employees tend to associate their company’s brand with positive emotions. In conclusion, a well-lit work-space can drastically improve the productivity and the brand image, as it promotes a stress-free, friendly work environment. If your company has outdated lighting fixtures you should consider replacing them with new, sustainable industrial lighting fixtures.